Palm Bay Elementary, Palm Bay, FL. 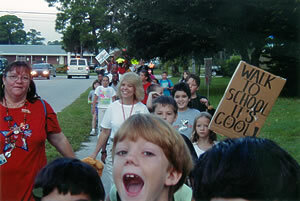 The safe routes to school (SRTS) concept began in the 1970s in Odense, Denmark, rooted in concern for the safety of children walking and bicycling to school (European Union Target, 2005). The SRTS concept spread internationally, with programs developing in other parts of Europe, Australia, New Zealand, Canada and the United States. The Bronx, a borough of New York City, started the first SRTS program in the United States in 1997. In the same year, the State of Florida implemented a pilot program. In August of 2000, the U.S. Congress funded two SRTS pilot projects through the National Highway Traffic Safety Administration. Within a year of the launch of the pilot projects, many other grassroots SRTS efforts began throughout the United States. Success with the pilot projects generated interest in a federally funded national program. In 2003, advocates convened meetings with experts in pedestrian and bicycle issues to talk about SRTS issues and ideas for developing a national program. Momentum for a national SRTS program in the United States continued to build as several states developed their own programs. Congress created the Federal-Aid Safe Routes to School Program in 2005 through comprehensive transportation legislation, ultimately resulting in nearly $1 billion in funding. Subsequent transportation legislation, Moving Ahead for Progress in the 21st Century (MAP-21) passed in 2012 making Safe Routes to School (SRTS) activities eligible to compete for funding alongside other programs, including the Transportation Enhancements program and Recreational Trails program, as part of a new program called Transportation Alternatives.